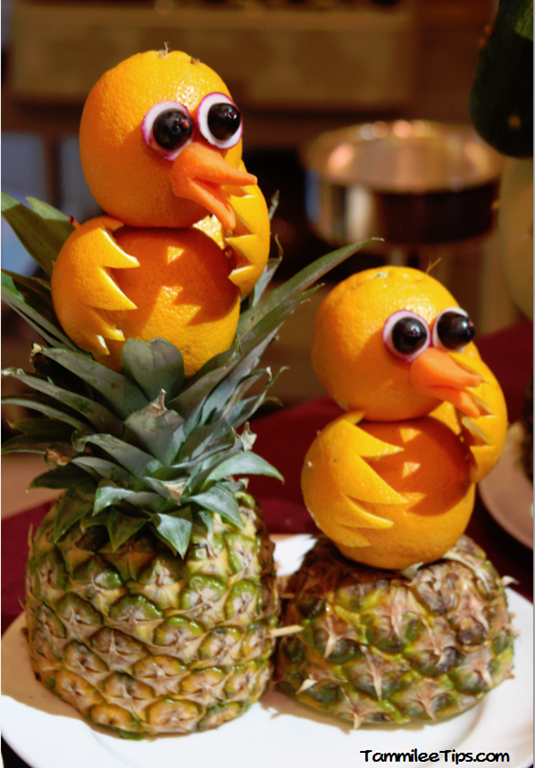 Have you ever tried to get crafty with your food? Cake and chocolate are one popular medium, but there is another level of difficulty with fruits and veggies that are soft or difficult to carve, change color when exposed to air for too long, or vary widely in color throughout. 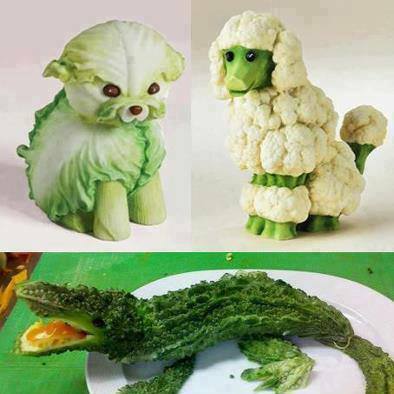 I would love to try making animals for parties or to get kids interested in eating more fruit and veggies. Some of the images I found are more simple, while others are true works of art. I like the use of the shape of the veggie and how it looks as if it is coming out of water. 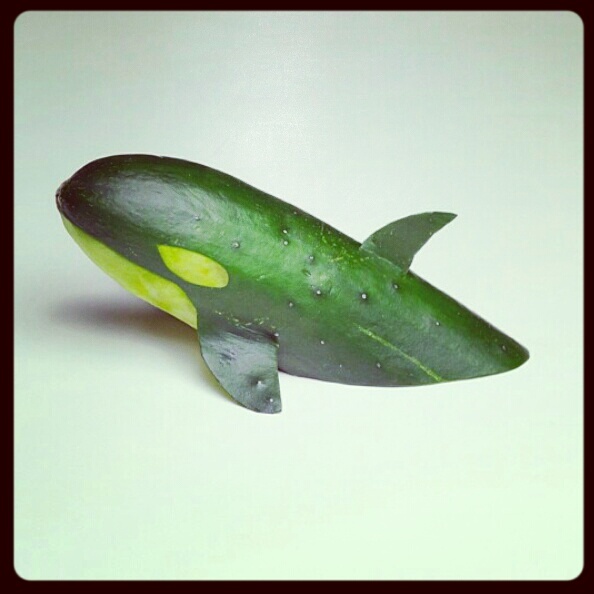 The fins as pieces of skin carved off but still attached to the main cucumber. Wonderful and impressive! 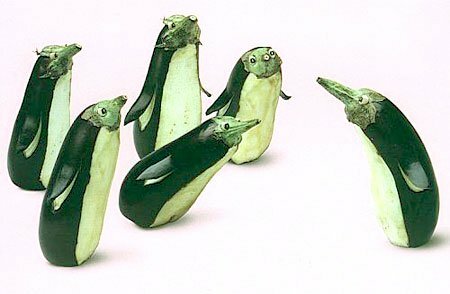 I like that with just a little bit of cutting and slicing (and some eyes) these eggplants are made to look like penguins. Again, the fins made from the skin itself is genius. 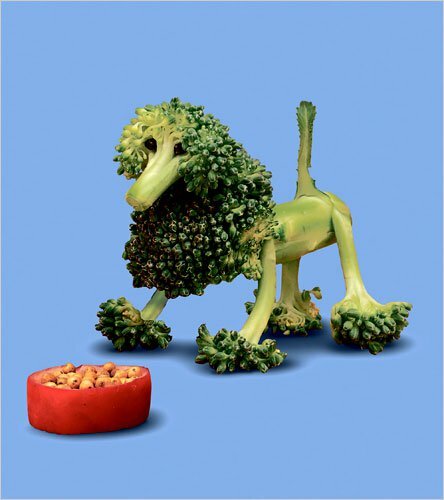 An innovative use of broccoli! I like this dog for the nature of the piece – its simplicity and look. I think it is just one head for the body and legs, with a piece which was cut off placed as the dog’s head. I like this one for its simplicity, you can easily recreate this for your next party. 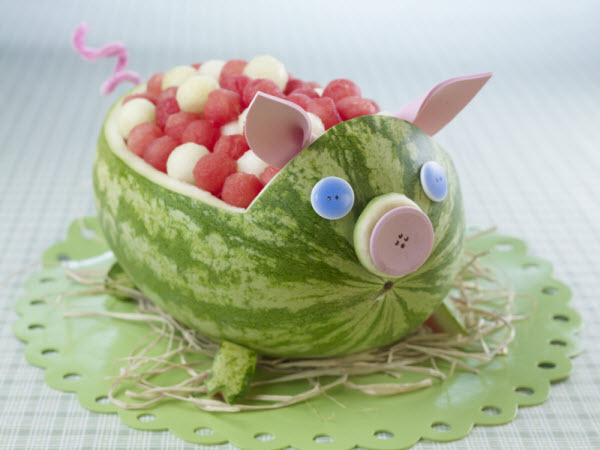 If you would like the list of basic supplies and directions see Watermelon Carvings. 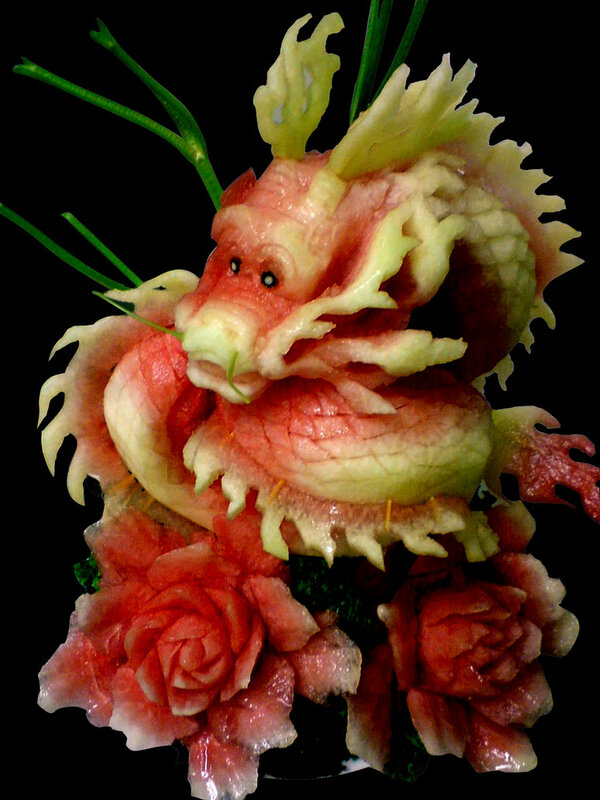 Watermelon Dragon – admittedly not the cutest animal, but this piece is incredible art! I would not imagine how you make something like this. 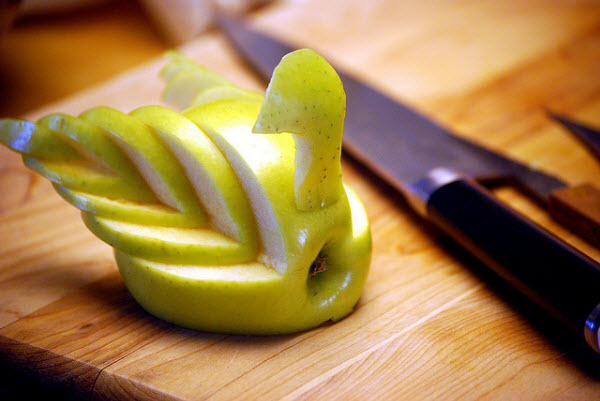 I found quite a few birds made out of various fruit, they seem to be a very popular subject. 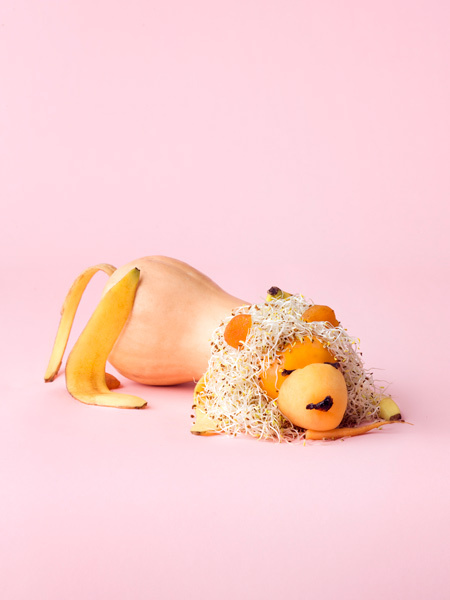 An owl made of pineapple, melon, orange peel feet, and a few other veggies. It was created to be a display for a cruise ship. This duck is amazing for its simplicity in lines and the few elements that it needs to convey what it is. I think with enough effort I might be able to make one of these. I would simply eat all my failures! 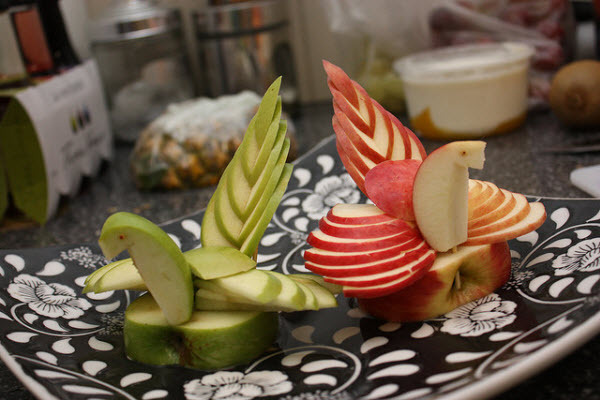 Okay, these swans add a new layer of complexity to the idea of an apple bird. With many more layers in their wings and tails I do not think that I could make one. 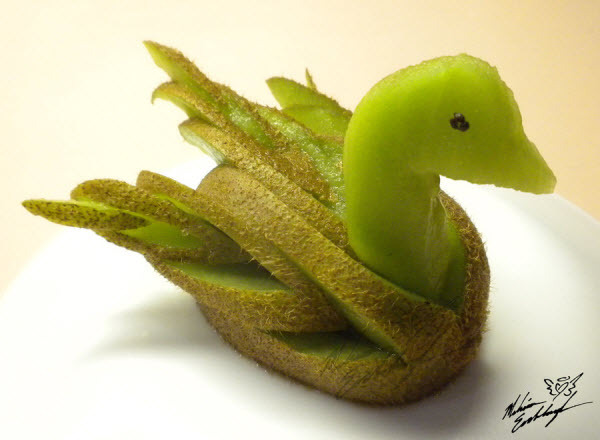 Yep, I would not be able to make something this beautiful out of a kiwi! I would end up with kiwi goo because they are too soft and small. This cantaloupe, orange, and carrot (?) 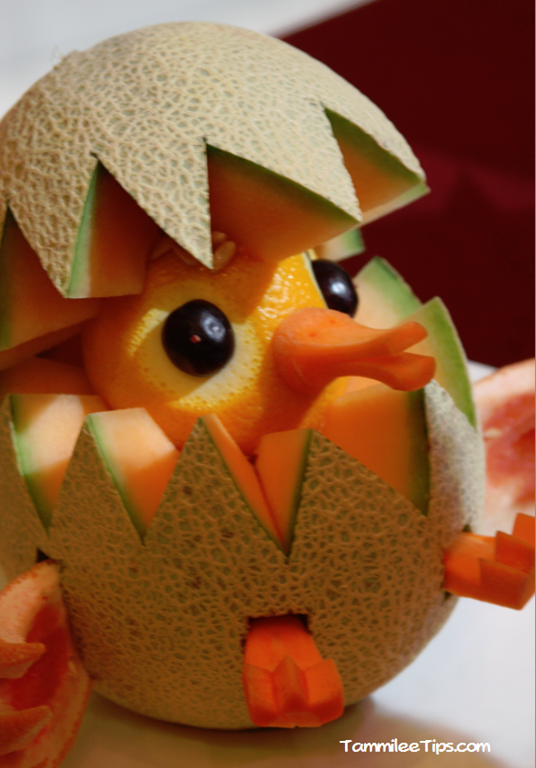 hatching bird is very cute! I love the feet sticking out, a very nice touch. I just wonder why they did not scoop the seeds out of the melon first? Maybe it acted as “glue” to hold the egg top on the orange head? These are fun display pieces. I like them, and I think kids would too. 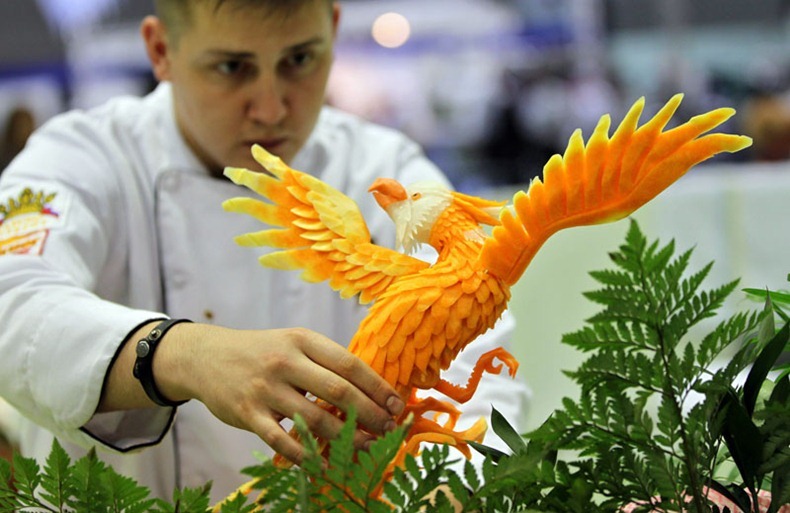 This masterwork was created at a German event in 2011 at the European Vegetable Carving Championships by Vadim Nefedov. This takes the idea of carved birds to a whole different level! So much detail with all the feathers, out stretched wings, and thin legs. 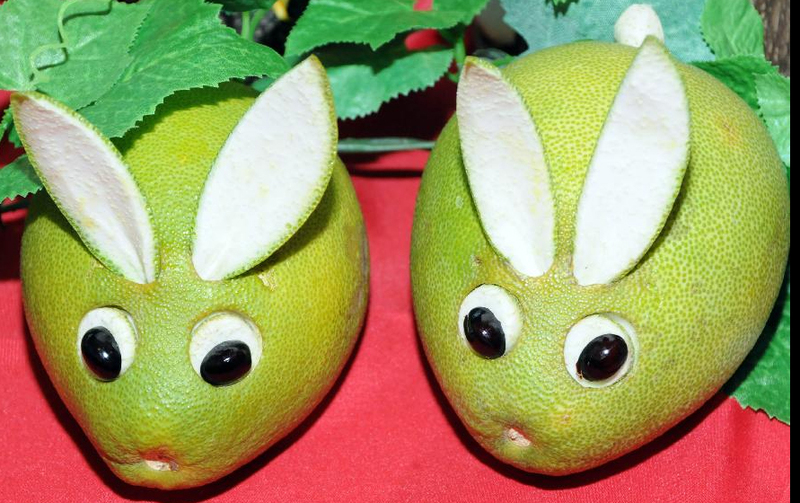 I have no idea what these bunnies are made out of, but the simplicity makes them so cute! 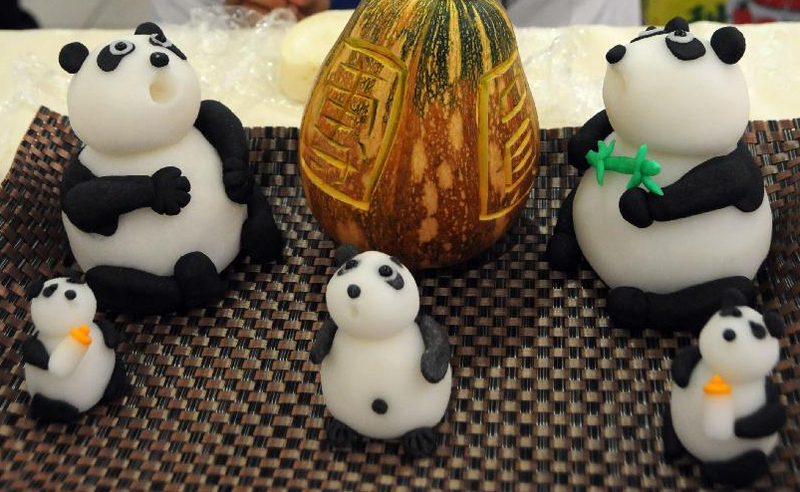 They were created for a fruit carving contest in Taiwan. I really like that they have little white puff tails. 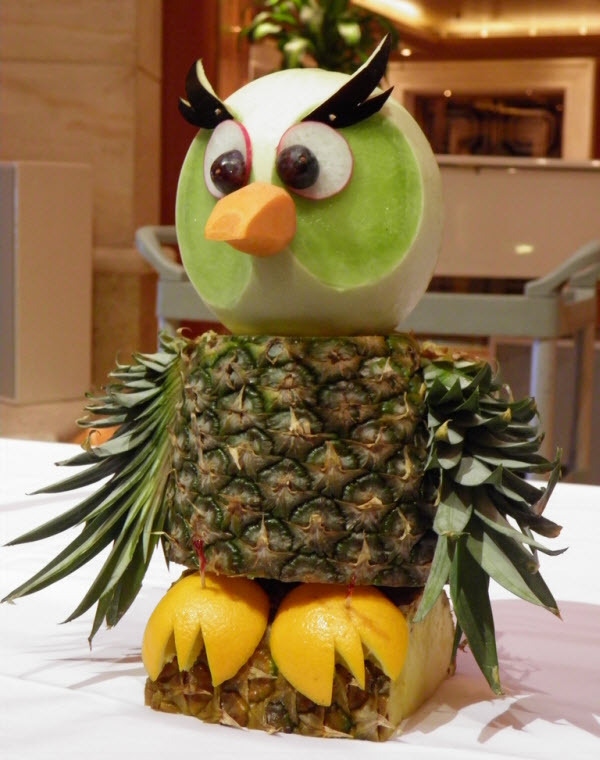 This is another piece from the fruit carving contest in Taiwan. The pandas are very impressive. I have no idea what kind of food was used in their construction. I love this lion! It looks like a whole squash for its body, banana peel legs/tail, melon head, and maybe a bean sprout mane. A very good use of multiple types of veggies and fruit to get different textures. 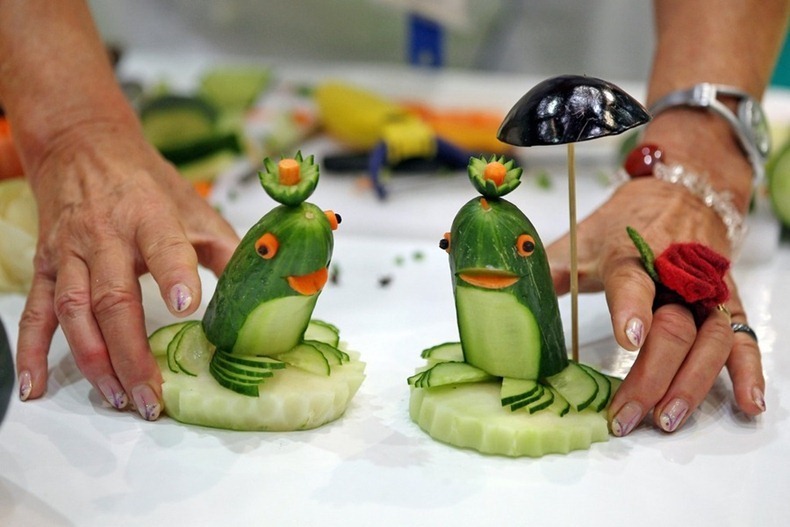 These two are made from cucumbers and carrots, whimsical and creative! Made out of bitter gourds at vegetable and fruit expo in Courtallam. I do not think I have ever seen this kind of gourd before, but it makes the perfect skin texture. I do not know where this picture originated, I found it linked from a number of places without any identifying information. The veggie dogs are adorable! I think the crocodile might have been made out of the same gourds as the above one? 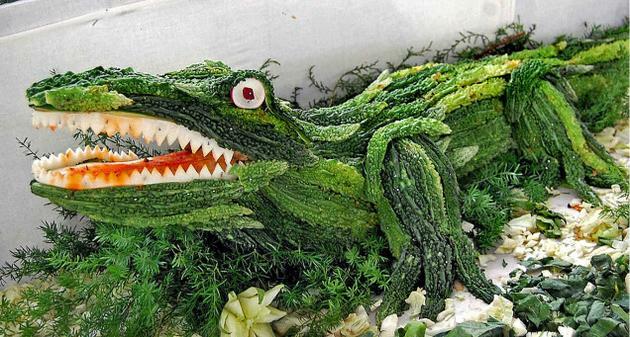 Have you ever made animal art out of veggies or fruit?